Posted March 1, 2017 by Sheri Bell and filed under the categories Apologetics, Resurrection. Apologetics Booklet Examines Factual Evidence of the Death and Rise of Jesus Christ. 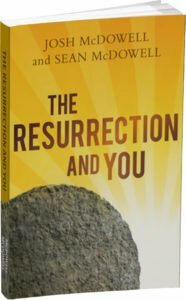 A critical historian would check out the validity of the records of witnesses, confirm Jesus’ death by crucifixion, go over the burial procedures, and confirm the reports of the empty tomb and Jesus being seen alive on the third day—and then consider possible alternative explanations of the event. In this, our first of six blog posts exploring the validity of the resurrection of Christ, we invite you to consider the factual, historical evidence that gives believers certainty that Jesus did rise from the dead, just as He promised! Whatever one believes about Christ rising from the dead, everyone has to admit that something significant happened on that morning—something so dramatic that it completely changed eleven men’s lives, enabling them to willingly endure abuse, suffering, and in many cases, death. Some people say they can’t believe the Bible because it contradicts itself. But does it really? We have to remember that the Gospels were written by men who all experienced Jesus differently. Though each tells the same story of Jesus’ death and rise from death, details in their accounts differ, because of their perspectives and chosen narratives. Luke, for example, used a technique called “telescoping,” which compressed time to simplify the telling. But in John’s gospel, we are shown that the events occurred over a longer period of time. Do apparent discrepancies in the Gospels undermine the Bible’s historical reliability? Well, we have to ask if these details are contradictions—or just differences. Statements may differ, yet not be contradictions. If you and I were to witness a person’s motorcycle accident, for example, what are the odds that we would later tell the evening news reporters the exact same details? Sure, we would get the overall story right: the motorcyclist was nicked by a car, spun into oncoming traffic, but amazingly survived after being tossed into a huge bale of hay on the side of the road. Beyond that, my version to the news reporter would probably deviate from yours, based on my vantage point and my personal perspective. Perhaps only I noticed that as the motorcyclist landed on the hay stack, the startled couple who had been kissing behind it screamed and fled, because they were embarrassed! In your version, you might mimic the words the motorcyclist shouted as he was launched airborne—words I didn’t happen to catch. Only the third witness, who got a good view of the rider’s Harley, could share how the bike flipped sideways, skidded, and smacked a stop sign so hard that the sign bent and grabbed the bike—like a preying mantis nabbing dinner. Do our apparent discrepancies undermine our reliability as witnesses? Not at all, as long as we truthfully retell what did, in fact, happen. The same is true for the Gospels. Most scholars now agree that the genre of the Gospels is ancient Greco-Roman biography. This genre allowed the authors the same kind of flexibility in reporting that you and I use in our everyday conversation. What event transformed the disciples from defeated, cowering persons in hiding to bold evangelists? The resurrection! Why were they willing to spread the Good News despite being beaten, imprisoned, and threatened with martyrdom? The resurrection! Jesus died, rose, and so impacted his followers with his defeat of death that they couldn’t stop sharing the amazing story. What gives us peace and strength today to share the Good News? The resurrection! Let’s journey the next six weeks together! In just six weeks we celebrate Easter. So in the next six five weekly blog posts, we will look at the exacting crucifixion and burial details, as well as the eye witnesses (many of them large crowds to whom Jesus appeared collectively), to prove the case that Jesus did, indeed, live, die, and rise as our resurrected Lord. It is our hope that by Easter you will know that you know that your faith in Jesus is built on the solid foundation of truth. Take the Easter Challenge: be thinking about a person with whom you can share the Good News! Invite them to church Easter Sunday! « What is the Best Evidence for Intelligent Design? Interview with Brian Johnson.